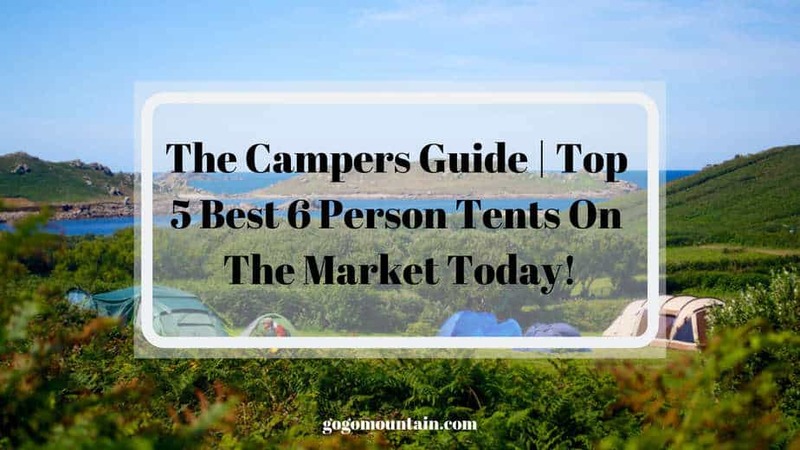 The Campers Guide | Top 5 Best 6 Person Tents On The Market Today! Home » The Campers Guide | Top 5 Best 6 Person Tents On The Market Today! If you’re headed out to enjoy the great outdoors, there’s only one major thing you need to think about (besides where you’re going to camp, that is! ): where you are going to lay your head at night. If you’re in the market for a 6-person tent, you’re in good company. A 6-person tent is a great option for larger groups, as well as for someone seeking just a bit more breathing room on his next camping excursion. Conclusion – What is the Best 6-Person Tent? We have done the work for you and broken down the top five best (In our opinion) 6-person tents. We ranked them based on their overall popularity and consumer ratings, as well as on their affordability, special features, and durability, among other qualities. When you’re searching for a tent, you want it to last you more than just one camping trip – you are making an investment in a tool that will allow you to enjoy the great outdoors for many years to come. A six-person tent is a wonderful purchase to make, as it will provide you with memories that will last a lifetime. Consider one of these five top 6 person tents to maximize your outdoor enjoyment today. The Coleman Instant Cabin, according to thousands of happy campers (no pun intended!) is exactly how it is described – it is like having your own personal, portable cabin in the middle of the woods. This tent is ridiculously easy to assemble, taking less than five minutes to set up. The spacious interior can fit two queen-sized airbeds or their equivalent. Plus, the interior of the tent features storage pockets so that you can stash your necessities without having to worry about them getting wet or destroyed. This is made possible through the tent’s resilient Bodyguard 2X material, which is also backed by Climate Tec. 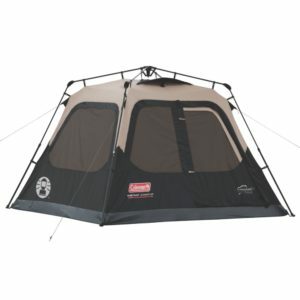 It also comes with Dark Room technology that can block up to ninety percent of sunlight from entering the tent. This is a nice feature, considering that sleep is a necessity on any camping trip, and early daylight hours can interfere with that precious slumber. The vented windows make it easy to protect yourself from the weather, while the tent’s thick material is difficult to tear or damage. While you can purchase a rainfly to accompany this product, it is not necessary, as it is fully taped. Finally, this tent is easy to store. It packs into an included expandable duffel bag so that you can tote it easily between the campsite and home. This 6-person tent is one of the pricier models available, but according to hundreds of happy reviewers, is well worth the money. 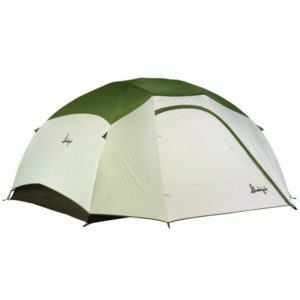 Made with unique Hydra-Shield technology, the tent is one of the most waterproof and breathable. The ceiling is well over six feet in height, making it easy to move around inside. It comes with four large windows, much more than you usually get in comparable tents, all of which have added mesh to protect against insects like no-see-ums. The tent also has two funnel-flow vents that help increase airflow, making it less sticky inside on warmer days. It’s one of the best options for winter camping, as it dries easily and helps minimize condensation and humidity. It is backed by a limited lifetime warranty and is incredibly rugged, offering campers years of successful wilderness trips without having to worry about tears or leaking. Coleman continues to win the hearts of outdoor enthusiasts around the country with its WeatherMaster tent. 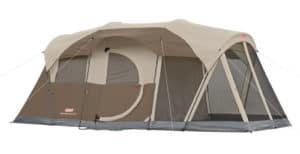 This affordable tent is incredibly spacious, offering a main room that is 11 feet by nine feet with an additional area of 6 feet by 9 feet of a screened in room. This screen room is a great option for campers with pets, or for those with very small children that they need to keep an eye on. It can also be used as an ancillary room for storing things like equipment, suitcases, or extra camping gear. The tent is made out of a durable fiberglass frame, which adds surprisingly little weight and set-up time. 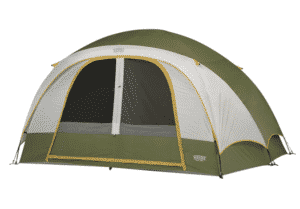 Most reviewers claim that the tent can be assembled in fewer than thirty minutes. With a floor made out of polyethylene and an inner mesh to help protect against the elements, this tent is a great choice when camping in inclement weather. 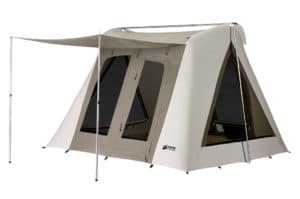 This tent even has a unique electrical entry port to make it easy for you connect all of your electronic devices. For campers seeking even more space, Coleman also makes this model in a ten-person version. The Slumberjack Trail Tent is one of the most portable of its kind, offered in sizes ranging from small two-person models all the way up to more spacious 6-person tents. It received top marks from reviewers for its durability and warmth under cold-weather conditions. It also performs well under rain and sustained winds, making it a good choice for campers seeking a more rugged backcountry tent. It is one of the few 6-person tents we examined that can fit into a backpacking bag. While the poles are not lightweight, it is easy to swap out lighter aluminum poles to make it easy to tote this tent into the backcountry. Most campers report needing to add a few additional materials, such as bottom tarps, to help make this tent the perfect option for backwoods camping. Those simple substitutions and additions are easy decisions to make, especially given the affordability and portability of this model. Both the tent material and rainfly itself are thick, water-resistant and resilient, backed by an additional waterproof coating. It’s easy to set up and while the vestibule and indoors pace is slightly smaller than other 6-person tents we reviewed, this is the best option for long backcountry camping trips. This affordable tent is made out of Weather Armor polyester fabric and reinforced with polyurethane coating. This unique technology helps protect against all kinds of weather, and also makes the fabric of the tent more resilient against rips and tears. This model also comes with shock-corded fiberglass poles, each of which is accompanied by Fast Feet to make set-up quick and easy. With three closable mesh windows and a mesh roof, this tent is one of few that also comes with an additional rainfly for added protection in inclement weather. This tent can be separated into two rooms to make camping spacious – and more breathable! The Wenzel even comes with a storage duffel to make carrying, storing, and packing it away just a little bit easier. This tent is backed by an impressive ten-year manufacturer’s warranty. The beauty of this is that you don’t have to worry about any damages ruining your outdoor experiences before you’ve gotten your money’s worth from this product. Finally, the tent also has built-in electrical ports, allowing you to stay connected when you’re out in the woods. Dependent on your personal requirements any of the tents on this list are a fantastic choice. Our personal favorite is the Coleman Instant Cabin. Reviewers also rave about the portability of this lightweight model, which makes it easy to pack, stow, and unload. It can be assembled quickly, so you don’t have to worry about campsite set-up taking too much valuable time away from your camping trip. All of these tents are excellent tents, but the Coleman Instant Cabin gives campers a resilient option that won’t break the bank. You’ll have more room to sleep and to relax, without having to worry about lugging around multiple tents or other equipment. If you’re in the market for a new 6-person tent, consider one of these options to make your next camping excursion a trip to remember. P.S – If a 6 person tent is a bit overkill for your needs, why not check out our top 5 picks of the best 4 person tents. Click Here To Read!